Serving McKinney, Allen, Frisco, Plano, Fairview, Lucas, Sherman, Denison, Denton, Dallas, Richardson, Prosper, Celina, Blue Ridge, Melissa. Storm Damage Can Happen at Any Time! Please dial 911 if there is a safety or medical emergency, but know that we're here to help you get your landscape and home back in working order as soon as possible! Dealing with a Tree that has been damaged by a storm can be a real headache, and it seems to happen when it's convenient! 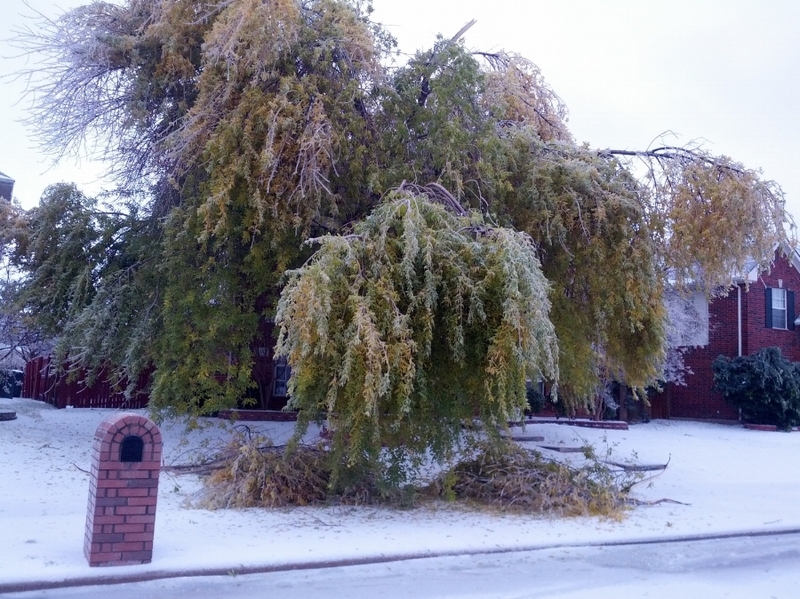 Whether it's ice covered branches breaking, wind damage snapping limbs, or tornadoes leaving devastation, North Texas Weather can wreak havoc on trees. Prevention is the best medicine, but sometimes even the most well-cared for trees can suffer sever damage in the mightiest of storms. Our Tree Emergency Response Crew is able to help get your home restored back to functioning order with ease. Our team has the skills, knowledge, experience, and tools to get the job done safely, removing broken branches, trees that have fallen, leaning trees, or uprooted trees laying on your home and building, we'll help you get your home and landscape back to normal quickly. US Tree Care is fully Insured and uses the most updated industry care standards for your protection! Assess the situation - if the tree looks intimidating, don't risk it. Tree work is the number 1 deadliest industry in the US today. NEVER go near a tree that is near any electrical or utility cable. Call your utility company immediately and have a Certified Arborist out immediately to assess. Determine if it can be Saved - some trees damaged in a storm can be saved. A good rule of thumb is if a healthy tree has 50% of the canopy intact, then it can probably be restored, however will probably need a lot of canopy restoration to prevent future breaking. Call in a Professional Certified Arborist to make the best decision regarding your "green pets," and come up with a Comprehensive Tree Management Plan. Follow the Plan - severely damaged trees will often be slow to recover, and it may seem like the fertilization or other treatment that your Certified Arborist prescribes is not working. Hold on, and remember that with your Comprehensive Tree Management Plan, that your tree will be monitored and adjusted as needed to best care for the tree. Trust your tree removal or after-storm restoration to the pros at US Tree Care to ensure that your decision regarding your tree is 1) the right decision, and 2) is done safely and efficiently!